If you’re ready to gain your independence and get out on the road, you need more than just a driving school to excel at this task, you need a knowledgeable instructor that teaches in a supportive environment. 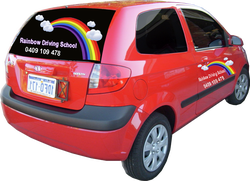 Rainbow Driving School is located in the Perth's metro area within Western Australia. We work very hard to offer a friendly, safe and reliable service. It is our main aim to make learning to drive as stress-free and enjoyable as possible. We take pride in our ability to give our students the skills and knowledge they need to enable them to pass their driving assessment with confidence. "Why not give us a call today"
"Quality Driving lessons need not cost you the Earth"